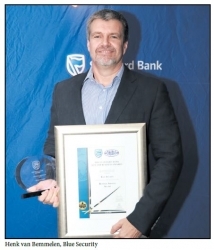 The winner is Blue Security Blue Security managing director Henk van Bemmelen said it was the first time the firm had participated in the awards and it was a complete surprise to be named as the winner in the category. The company employs over 600 people in the province and provides a professional armed response service to thousands of clients in the greater Durban area. "We are thrilled and honoured to come out as the winner in the best service provider category. We attribute this accolade to our dedicated team of staff who are committed to serving our clients with professionalism and integrity and who go the extra mile to improve the safety and security of the communities in which we work." Van Bemmelen said. The company was also awarded second place in the Top brand category after thousands of fans voted for the firm in the on-line poll. "We would like to thank our customers, many who also work closely with us to fight crime in their communities through neighbourhood watch and patrol groups, for their appreciation of our efforts demonstrated in this strong vote of confidence in our brand. We look forward to strengthening our relationships as we serve and partner with our communities in the future,"
Ec3 was founded in 2013 out of a small garage in Durban with little more than three sales agents, and a massive dream to disrupt the business process outsourcing (BPO) sector. The sectors which are serviced include telecommunications, financial services, online gaming and vehicle tracking. The 1st Call Group, the fastest growing business process outsourcing in South Africa, has an international reputation for providing world class customer experience to customers from across the world, out of their state of the art contact centre in Durban. Saskia Hill, owner of MCS Debt Recovery, says that the success of her business has been based on treating her staff as assets and believes that happy staff equate to successful collectors. MCS Debt Recovery.